“Team, I just read an article about social marketing. We need to get on Twitter,” said the manager. “Okay, what are we going to post?,” the marketer responds. “Anything and everything that is news worthy for 5 times a day,” the manager squawks back. Put on your detective hat! 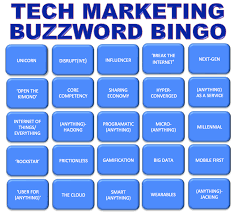 Buzzword bingo is all too common in Marketing Automation. Even the term Marketing Automation is debated as to its extent and purpose. Marketers, being forced to be more technology centric, should go back to the basics by asking… Why? The answer should identify problem to solve or improve the chances of achieving/surpassing a goal, not just another check mark on the to-do list. Why do I need lead scoring? Why do I need to align sales and marketing? Why is feature X going to help us do our job better? Hopefully, by going deeper into the need, you and the team can be more effective in those efforts. Avoiding the Buzzword Bingo Trap? Buzzwords do represent something that we can all relate. Again, using ‘Lead Scoring’, helps everyone understand that a certain capability exists in a system. The key is its usage as it applies to your organization. For instance, one organization may consider Lead Scoring for prioritization of leads, others would leverage them for lead quality. For some, marketing automation, is a single online marketing capability (email, a CMS, a database) for others, it can be considered an ecosystem for complete process operations for the marketing/sales pipeline. When you receive marching orders from above, try understanding the problem you are trying to solve. It benefits everyone to be on the same page. If you get a sales pitch, dig into what other problems this feature or process has solved for other organizations. If it’s not mesurable, seriously consider if it’s really worth your time… especially if your a marketing octopus. The key is asking what is the purpose of this feature/capability hence we should always ask…Why?